South Africa’s Asi-B Films is proud to announce an international distribution deal with Multivisionnaire Media, an international distributor based in Los Angeles, USA, for a new HD reality series called ‘Cake Dreams’. This show follows the life of a French expat living in South Africa, who left engineering to become a baker. With his engineering skills, he manages to turn each cake he makes into a masterpiece. Set against the backdrop of a dramatic family life, which has its constant ups and downs, and a goal of feeding every child in South Africa, Paul the engineer-turned-baker is determined to turn each challenging situation into a dream. With 13 episodes making up the first season, we will see as Paul the step-father tries to keep his family together whilst also launching a new bakery and trying to keep up with his community service as well. This series will take us around urban South Africa showing us a side of the country few have seen. 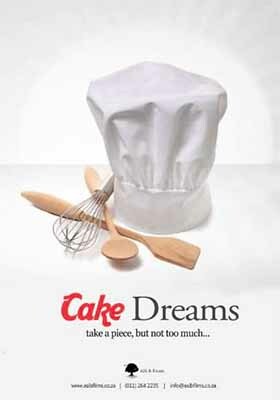 With drama, humor, tension and joy, ‘Cake Dreams’ is more than just a baking show; it is a true example that man cannot live on bread alone.